It’s blazing hot outside. Let’s make some corn salsa and turn it into a meal! 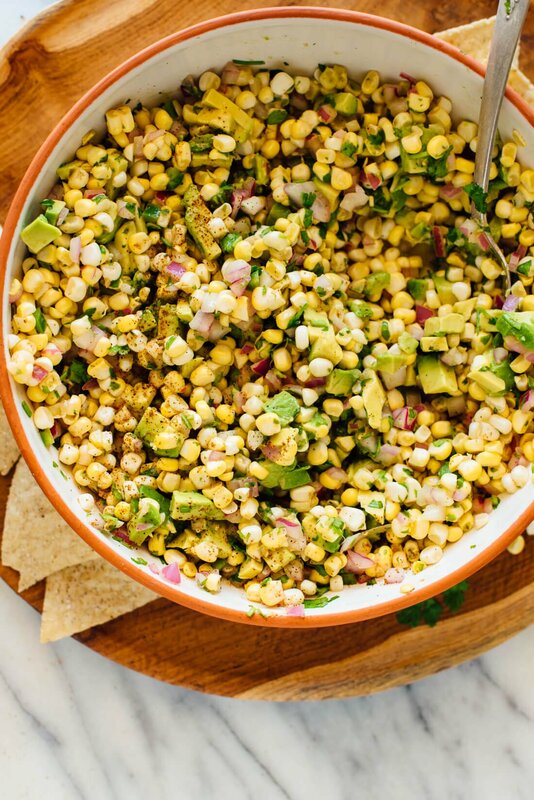 Like Chipotle’s corn salsa, this version with fresh sweet corn goes great in tacos, burritos (or burrito bowls), and quesadillas. 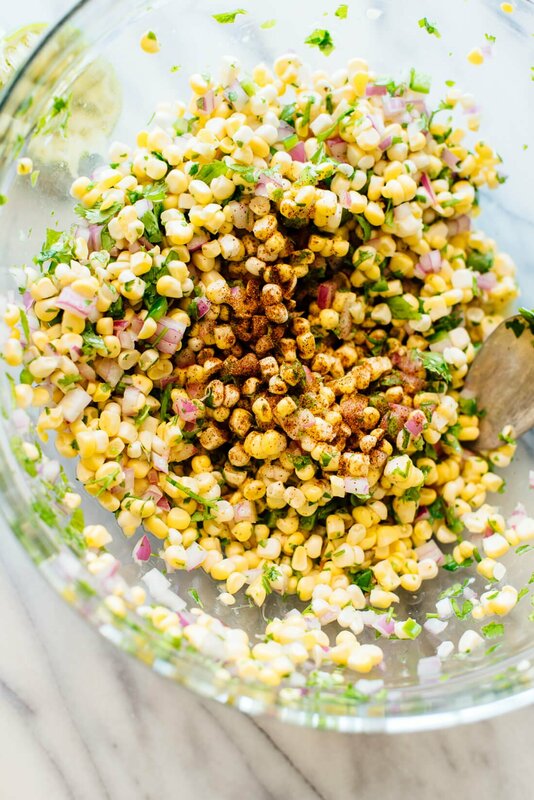 This refreshing corn salsa would also complement grilled mains, like my go-to veggie burgers (available in my cookbook). You could also pile this salsa onto greens to make it a salad for lunch—just add a drizzle of olive oil and an extra splash of vinegar, if you’d like. 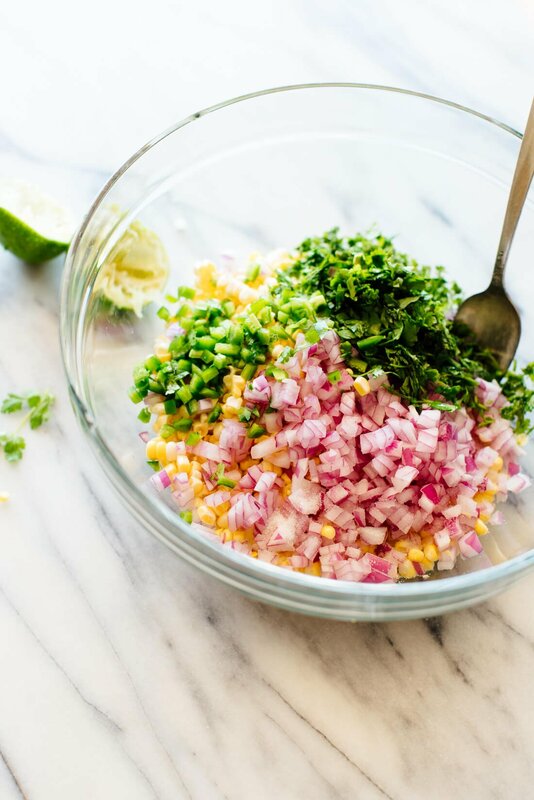 This corn salsa recipe is made primarily with fresh sweet corn, red onion, cilantro, jalapeño, and lime juice. I added a few basic pantry seasonings for intrigue and oomph—white wine vinegar, chili powder and ground cumin. This salsa is fresh and bright, and it’s easy to make. The sweet corn steals the show, as it should. I hope you love it as much as I do! Buy fresh corn and use it promptly. Freshly harvested corn has the sweetest, most delicious flavor, and it loses that flavor as time goes on. Raw corn is delicious. Yep, I used raw corn kernels in this salsa. The only “cooking” they need is a brief rest (15 to 20 minutes) so they can soak up some lime juice. You can use any type of sweet corn, though. 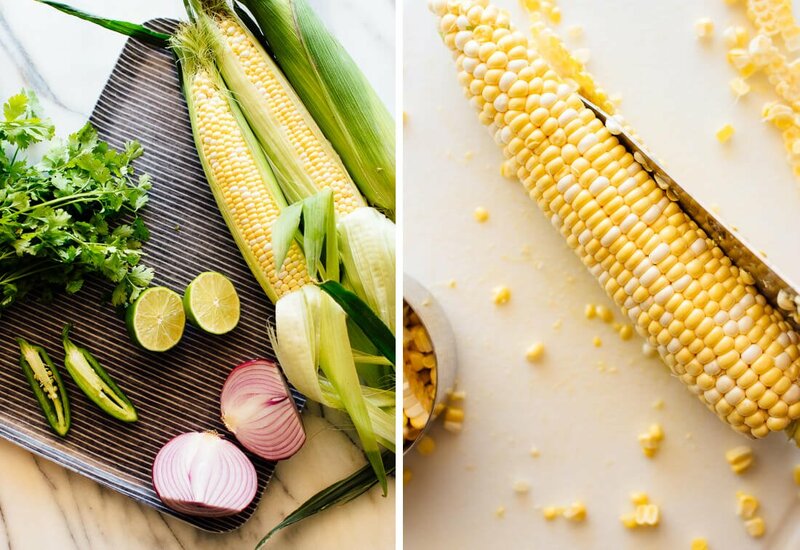 Want smoky, grilled flavor instead of sweet raw corn? Grill your corn first! Want to save some time, or make this salsa after summer ends? Use frozen corn, defrosted and drained first. Canned corn would be my last resort, but if you like the flavor, by all means! How to cut corn off the cob: I find it easiest to just lay the corn down on the cutting board (see second photo in this post). Slice off a strip of kernels lengthwise with a sharp knife, rotate so the flat side is against the cutting board, and repeat as necessary. Why? Standing the corn upright sends kernels flying, and doesn’t offer a stable base for cutting. Avocado is optional. This salsa is nice and simple without it, but the avocado does add some nice creaminess. There is enough lime juice/vinegar in this recipe to keep the avocado green overnight. Please let me know how you like the recipe in the comments section on this post! I’m eager to hear how you serve this corn salsa. Craving more simple salsas and refreshing dips? Don’t miss my 10-minute red salsa, classic pico de gallo, creamy avocado dip, strawberry salsa, mango salsa, salsa verde, and guacamole! 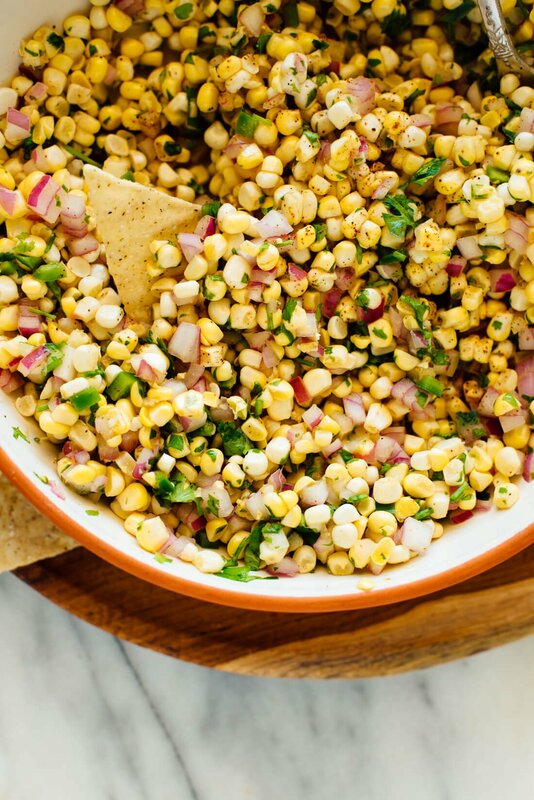 This fresh corn salsa recipe is the perfect summer appetizer! It’s made simply with sweet corn, onion, jalapeño, cilantro, lime and a dash of chili powder (avocado is optional). Recipe yields about 4 cups salsa. In a medium serving bowl, combine all of the ingredients. Stir to combine. Adjust to taste, if necessary: For more zing, add about 1 teaspoon more vinegar or 1 tablespoon more lime juice. For more flavor overall, add another pinch of salt. For more spice, add more jalapeño. For best flavor, allow the salsa to marinate for 20 minutes before serving. 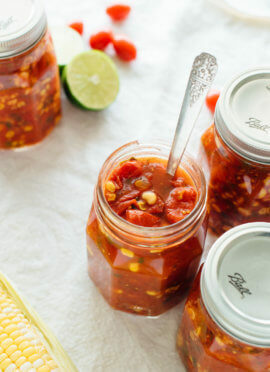 This salsa keeps well in the refrigerator, covered, for 3 to 4 days. Recipe roughly adapted from my black bean salad. Corn options: I love raw sweet corn here, but you could also use frozen corn, defrosted and drained. Want more smoky flavor? 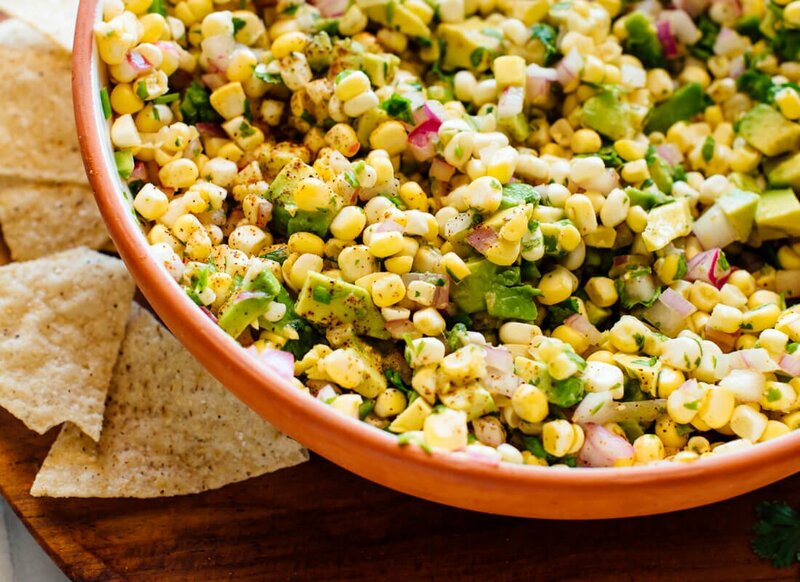 Grill your corn before making this salsa! Hi! This really looks yummy! I’m not on instagram or Twitter but I really don’t see any reviews on the recipes. Are you new? Keep it up! Everything looks amazing! Delicious! 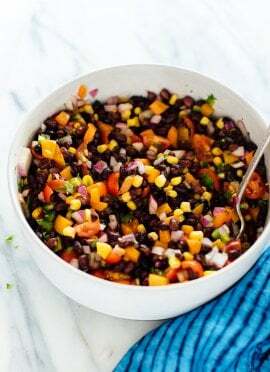 We were already planning on making the colorful weeknight burrito bowls from your cookbook and I was just going to do corn on the cob, but this salsa was a much better option and was most excellent with the burrito bowl. Thanks, as always, for your tasty, fresh recipes! Yes, great combination! Thanks for your star review. Had all the ingredients and am planning a burrito bowl for lunch tomorrow – this came together wonderfully. Thanks for another amazing recipe! So good! Wonderful! Thanks for sharing, Terri. I literally wanna dive head first into this corn salsa! Thank you!! I love to hear that, Kati. Enjoy the book. A labor of love for sure! This was excellent! We were already making the colorful weeknight burrito bowls from your cookbook, and I was just going to do corn on the cob, but when this recipe popped up in my inbox, I knew we had to try it. Very tasty! And easy to throw together, I just used about 1/4 of the cilantro – still great. Thanks, as always, for all your great recipes. Great combination! Thanks for your star review. This was fabulous! It came together SO quickly (seriously, like 5 minutes) and the flavours were fresh and satisfying. This is definitely going into my summer rotation. I forgot to pick up jalapenos and substituted red pepper flakes – definitely not the same flavour, but worked in a pinch! On another note, I made this for the first time on an evening I was having company over – a risky move! – and of course it turned out perfectly. Thank you for your delicious, nourishing, and consistent recipes! Thank you, Sarah for trying and for your review! I really appreciate it. Put this generously over crispy lettuce and added black beans, tomato and avocado. Great summer dinner! Thanks for continuing to post great vegetarian options. You’re welcome, Erica! Thanks for your review. It’s so good! Thanks for your comment, Susan. Just happened to get 4 ears of corn and a couple of tomatoes in my CSA share, so I made this and some pico de gallo (also your recipe). Delicious! Plan on making this all through the summer. That’s great! Fresh corn is so delicious. Thanks for your review. I made half of the recipe yesterday and we ate it all! So good! Went today and bought ingredients to make the full recipe! Such awesome flavor with very simple ingredients! We were talking about adding this to our tacos! Lovely, Susan! Thanks for sharing and for your review. Simple and delicious! I grilled my corn lightly on a grill pan, omitted the avocado, and served with your portobello poblano fajitas (one of my all-time favorite recipes) with slice avocado and red salsa. I added a little feta to the leftovers and ate them on their own–so good! I feel like you could add pretty much anything you wanted to this salsa– black beans, diced bell pepper, halved cherry tomatoes–and it would be good. Easy and delicious. I used frozen corn and cooked in an iron skillet until charred. I’m going to top black bean tacos with it. Sounds delicious, Danica! Thanks for your review. Love your recipes and the options you provide to make substitutes! I share your site with my friends. Simple, delicious & always healthy! This past week, we didn’t have corn in our CSA box, and I nearly cried. We’ve been making this salsa for the past few weeks, and it is amazing. We eat it as a side dish, though — it’s out there…..I don’t think I could limit myself to eating it as just a salsa. I love to hear that! Thank you, Jennifer. I made this yesterday & all who tried it loved it (including my kids)! I did throw the onion in the blender, and as I didn’t have jalapeno I added a little red ancho chili powder that had a very subtle heat in its place. This is a recipe I will keep around for a long time. Thank you so much for sharing! You’re welcome, Kelly! Thanks for your review. Made this today. Delicious! Another keeper from Cookie and Kate. My family loved it! My husband has GERD, so I subbed milder ancho peppers for the spicier kind and threw in a little smoked paprika. It gave me something different to do with the fresh corn that I found on sale. Especially loved by my gluten-intolerant daughter who is always looking for something healthy to snack on when she gets home from classes. Thank you for the recipe! This was a hit in our house for dinner! So great to hear, Fran. I appreciate your review! I slice corn kernels off the cob by putting the thin end of the cob on the hole of a bundt pan, and then slicing vertically. Almost all the kernels wind up in the pan, and are easily scraped put with a rubber/silicone spatula. Your recipes sound great. 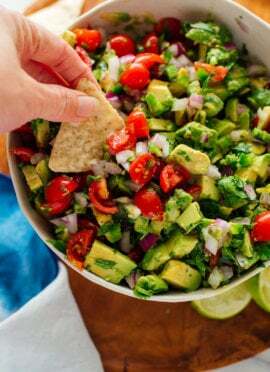 I will be trying Corn Salsa and the Herbed Avocado Sald as soon as I can get my hands on some good Avocados! Thanks for the tip, Flicka! Great recipe! I stumbled upon it while trying to figure out some meal prepping for a calorie cut and it is the perfect low calorie burst of flavor that my meals needed. My question is: have you ever tried it with frozen corn and how much of a difference did it make? I prefer fresh corn, but you could use frozen. I’ve heard it’s worked fine. Just make sure to thaw/drain any excess water. Thanks for the review, Zach!